There's a new push to get American Indians to the polls in November. 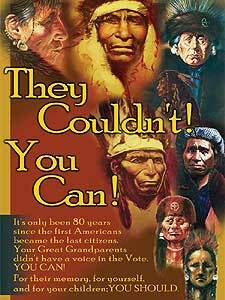 Native Vote 2004 is targeting some two million eligible voters in a dozen states. American Indians are a small percentage of the total population, but in a tight race, all votes are important - and could determine who sits in the White House. Duluth, Minn. — Veronica Smith is bit of a pest to the residents of the Fond du Lac Ojibway Reservation near Cloquet. With a fist full of voter registration cards, and a bucket of buttons and pens, Smith is working the crowd at a seminar for the tribe's Human Services Department. Just about any place tribal members gather, Veronica Smith is there. "At the pow-wows," Smith says, "Health fairs. We are planning on going into the casinos, into the employee's lounge, after we talk to the managers to make sure that's ok. And even at events like this, where most of the people are registered and are voters - but even they know people who aren't registered to vote," Smith says. Smith is out get every eligible tribal member to the polls November 2nd. It can be a daunting task. Historically, only one in five actually vote. American Indians are the least represented group at the polls. They weren't even given the federal vote until 1924. Smith says many still haven't learned how to vote. "I think maybe it might be because they're not sure of what to do, and how to do it," says Smith. "How to (vote.) Where they need to go to vote at. It's the process," Smith says. "I believe it is the process." But there's also something of a disconnect. Long isolated in rural America, Native Americans might have little faith their vote will matter. And candidates have had little reason to court the Indian people, who make up less than two percent of the U.S. population. Naomi Bernard is helping at the voter registration table. This year, Bernard is optimistic. We have 33,000 American Indian eligible voters. If we got those voters out ... we can determine how that election is decided. "I think that 2004 is a definitive year," Bernard says. "And that it's time to,(for)Indian people to take the initiative to realize that one vote can make a difference." An election in South Dakota two years ago was an eye opener. Political observers say tribal votes kept Tim Johnson in the U.S. Senate. Now, Bernard says, Native Americans are getting new attention. "Minnesota is one of 12 states that are being watched closely by political observers as to the strength of the Indian vote," Bernard says. "And both major parties are actively courting the Indian vote." Democrat John Kerry was recently honored on a New Mexico reservation, and President George Bush hosted American Indian leaders at the White House. While Indian numbers are small, they can make a formidable voting block, according to Melanie Benjamin, Chief Executive of the Mille Lacs Band of Ojibway. "You look at the State of Minnesota," Benjamin says. "We have 33,000 American Indian eligible voters. If we got those voters out - and that's our goal to do that - we can determine how that election is decided." That's the lesson from Florida - a state George Bush captured by a handful of votes. Native Vote 2004 is billed as a non-partisan effort. Instead, volunteers have compiled score cards on the candidates positions on indian issues - like housing, health care, and the environment. Financial support comes from the tribes. Judy Hanks is helping coordinate Minnesota's Native Vote 2004. Hanks says tribal casinos have generated economic power. But, Hanks says, most Americans don't understand Indians unique place in society. "In my personal opinion, that would be the greatest thing that we could achieve," Hanks says. "(Have) our elected officials recognize our sovereign status, and respect it. And work with us on a government-to-government basis. If we had that dialogue going, there wouldn't be, in my opinion, many of the conflicts that do exist today." Hanks says the goal this year is voter turnout. In coming years, the project will work to put more Native American candidates on the ballots.